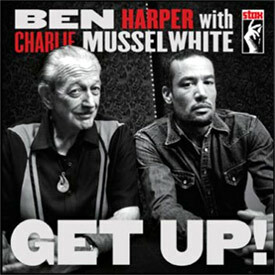 Ben Harper and Charlie Musselwhite will perform on the Tonight Show with Jay Leno on January 22. The paired performers will preview a song from their debut collaborative album, Get Up!. The album is due out on January 29 via Stax. The musicians will play a few shows tied to the album’s release this winter. Those dates include stops at New York’s Irving Plaza (1/29), Toronto, Canada’s Danforth Music Hall (3/1), Royal Oak, MI’s Royal Oak Music Theatre (3/2), Chicago, IL’s Riviera Theatre (3/3), Fremantle, Australia’s West Coast Blues ‘n’ Roots Festival (3/24) and Tyagarah, Australia’s Byron Bay Bluesfest (3/28). Looking ahead, they will also perform at Rio De Janeiro, Brazil’s Rock in Rio (9/20). For more information, visit the website jambands.com.